Tell us about how Okka Kshanam happened? I was looking for an interesting script and somebody told me that Tiger director had a nice subject. I always wanted to do a new script. But I lost confidence and courage when my debut Gouravam failed. Then I tried films like Kotha Janta (entertainment orientation) and Srirastu Subhamastu (family emotions). Kotha Janta was a moderate success. I resonate with films like Mr. Perfect, Bommarillu etc. Hence wanted to try a genre which I personally like and did Srirastu Subhamastu. Srirastu Subhamastu gave me more confidence that I can try new subjects again. I was blown away by the idea narrated by VI Anand. I have okayed the film in 40 minutes of single sitting. He was doing Ekkadiki Pothavu Chinnavada at that time. My dad heard the script only after I have signed it. He gave his inputs and saw the final copy in avid. That was the only involvement of my dad in Okka Kshanam. What is Okka Kshanam story all about? Okka Kshanam deals with parallel life. Things that happen in the lives of Srinivas Avasarala and Seerat Kapoor repeat in our (me and Surbhi) lives. The things that happened in the lives of Srinivas and Seerat are not pleasant. Hence we try to circumvent the fate. This film deals with the concept of destiny and if it is possible to alter destiny by our deeds and will power (sankalpam). It’s not just a high concept film. There is a second layer to the story, which makes it more beautiful. The second layer connects with audiences at deeper level. How do you respond to allegations that Okka Kshanam borrows its idea from a Korean film ‘Parallel Life’? As I said before, the story of Okka Kshanam is original. Just like there are several films that came with the concept of retrograde amnesia, time travel and incarnation, this film deals with another unique plot point called parallel life. Rajamouli dealt with the concept of reincarnation in one way (Magadheera) and Vikram Kumar dealt it in another way (Manam). What makes director a great storyteller is his ability to deal with such unique plot points and convey them in such a way that a normal filmgoer understands it. I see those traits of a great storyteller in VI Anand. These days, you can’t make a statement that your film is original and get away from plagiarism. Entire content is available on internet and people can watch those films and verify. People troll with screenshots on social media on copied movies/music. I am very much sure that Okka Kshanam is not a copy of Parallel Life. You are looking good in this film. Have you gone through any facelift? It’s more about grooming. Short hair doesn't suit my round face. I grew my hair more for this film. I had a short beard which also suited my face. I made peace with the fact that I am average looking and I am happy with that. Hence I didn’t stress out much about my looks in this film. I am more confident of myself. I would give 50% of credit for my looks in this film to Sam K Naidu. He knows about lighting very well. You saw the entire film. What is your gut feel? I like the film and I think it should work at box office. I am sure people will get curious about parallel life and start googling about it after they watch Okka Kshanam. People will be interested to know some of coincidences in their lives might be a result of a parallel life. 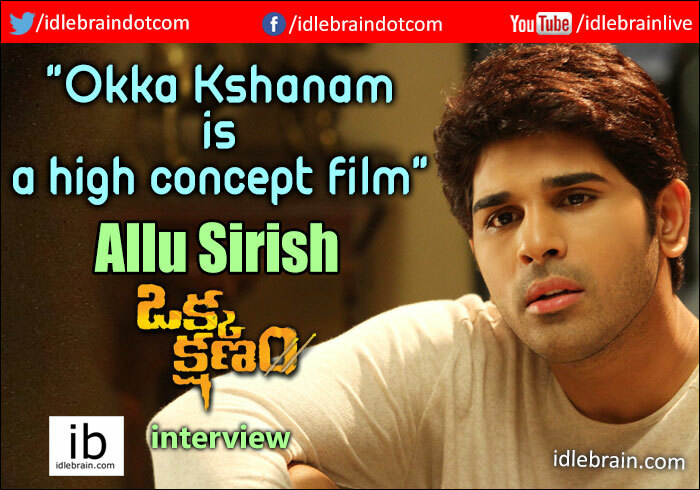 Though a high concept film, Okka Kshanam also has a strong emotion. It has its heart in place along with the brain. I don’t want to make sweeping statements about Okka Kshanam and I am waiting for the verdict of audiences. Tell me the kind of release it is getting? Producer Chakri has secured best release for Okka Kshanam. This film is getting big publicity and bigger release. Trade is positive about the film. Tell me about your next film? I want to do a coming of age love story for my next film. Nothing is finalised yet. I want to give a shot for a web series, if I get time and the right subject.